Introduce the bold, exotic flavors of the Philippines to your next large event or intimate function when you rely on the Tribu Grill for catering service throughout Union City, California, and surrounding areas. Beyond drop-off food catering, we can provide wait staff and servers at your location to work your event as well. 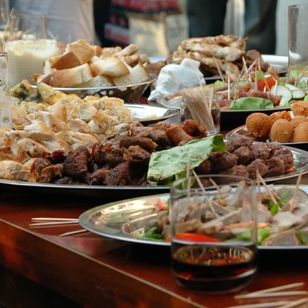 For smaller catering parties, we only require a 24 hour notice. However, we ask those with a large-scale event for notice at least one week in advance. This ensures we have all of the equipment available. Pricing depends on the size of the party. Speak to a representative today by calling (510) 675-0101 to discuss how we can make your next outing a spectacular event that everyone will remember.